In last week's midterm elections, the Republican Party scored historic victories at the national, state, and local levels of American government. Thus, the American political landscape and balance of power is vastly different today than it was before the November 4th election. While a wave election, such as what we saw last week, does not solve all of our national problems, it certainly will go a long way toward slowing down the progress of evil that has dominated our nation over the past six years. Conservative Christians made up almost one out of every three voters in the 2014 electorate, playing a decisive role in the Republican wave that resulted in control of the U.S. Senate, a record majority in the U.S. House, and critical victories in governors' races, according to a post-election survey. "Conservative voters of faith were the largest constituency in the electorate in 2014," said Ralph Reed, founder and chairman of the Faith & Freedom Coalition. "Their share of the electorate exceeded that of the African-American vote, Hispanic vote, and union vote combined..."
As Mayor Parker soon discovered, when you touch one pastor, you touch them all. News of this gross First Amendment violation quickly went viral and even made its way onto some national news outlets, such as Fox News' "Huckabee." The American Christian world in that instant saw exactly what Godless, liberal, humanism is like on full display. When this wicked philosophy gains political ascendancy, it almost always uses its power to persecute biblical Christianity. 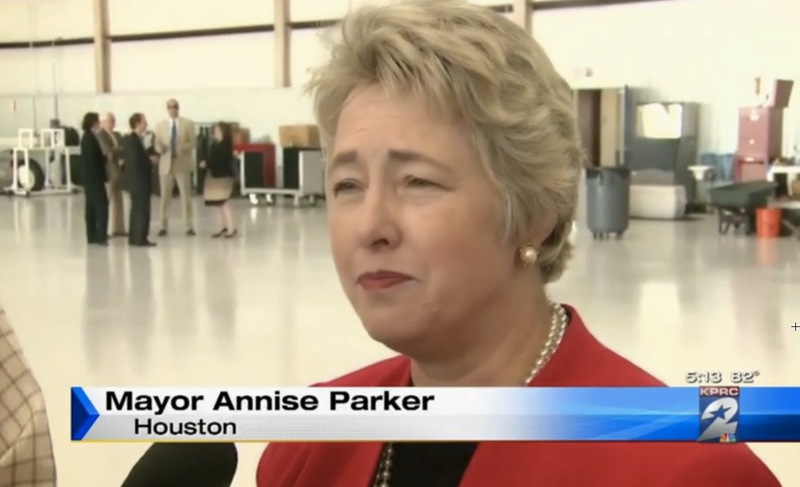 There it was on full display for the world to see thanks to Mayor Parker's totalitarian mindset. Consequently, the Christian public was quickly galvanized and reacted by using a tool wisely supplied to us by America's founders. All over the country, the Christian public consequently voted out of power the current political party in power, which in this case was Mayor Parker's Democratic Party. Of course, there have been several other events that have taken place over the last several years that have also played a significant role in contributing to the awakening of the sleeping giant of American Christendom. Such events include Obamacare's persecution of Hobby Lobby as well as the plethora of cases around the country where Christian bakers and florists have found themselves on the wrong side of the law for merely declining to participate in gay weddings. However, Parker's tyrannical behavior "sealed the deal" thereby causing the Christian public to rise up and say enough is enough. Last Tuesday's landslide was the result. In short, if Tuesday's election goes down in history as playing a significant role in preventing the Obama Administration from "fundamentally transforming" America, it will turn out that it was in actuality the influence of Christianity and Christians that saved our country. Last Tuesday's election results provide an important "teaching moment." Three lessons come to mind. First, it reveals the power that the Christian church still has to influence the direction of our civilization when it wants to. When we wake up, flex our political muscles, and exercise our legal and constitutional rights, we have the ability to send the powers that be a powerful message and knock evil back on its heels. In the wake of this victory, my hope and prayer is that the Christian world will not now fall back asleep since greater challenges inevitably lie ahead. Second, the existence and influence of Bible-based Christianity in our culture will always serve as a natural hindrance and impediment to the triumph of the liberal agenda. Liberals themselves know this. There is a reason why Peter Jennings airs Easter specials trying to debunk the historical Jesus rather than trying to discredit Shakespeare or Muhammad. There is a reason why Christian leaders are invariably persecuted, murdered, and imprisoned within Marxist dictatorships. It is the Bible itself that condemns liberal humanism. Thus, as long as any culture is the home of enough Bible readers and believers, a built in resistance will always exist against any such leftist social agenda. Third, there is an important message here that the Republican Party needs to hear: we Christians are the ones who put you in power. Never forget that we are not overly enamored with you. This time around, you were simply the best option at the moment for legally voicing our concerns and altering our country's political landscape. As we say in Texas, "Don't forget who brought you to the dance." Should you forget exactly who handed you this political victory thereby causing you to pursue a "Democrat-lite" or a milder progressive agenda over the course of the next two years, then you will most likely hear from us again. Should this happen, keep in mind that in 2016, the results may be very different than they were in 2014. We are watching!